Noud van Dijk is playing his first live tournament here in Bucharest at the Unibet Open. He spends his time playing poker on Unibet in the micro stakes tournaments under the nickname "_Noud_" and does so with the occasional successes. Van Dijk’s road to the Unibet Open Bucharest hasn’t been the easiest as he took the long road to qualify. Van Dijk had €4 left in his bankroll on Unibet and he decided to play a €0,10 satellite. He managed to win a €4 ticket and spun that up to a €25 ticket. With that ticket, he managed to win a €250 ticket and he jumped into a satellite with four packages right away. Van Dijk won the package and he managed to turn his initial €0,10 buy-in into a €2,000 package and is now suddenly playing in a €1,100 tournament that is fast approaching the money. Van Dijk was short on Day 1a when he had just 10,000 left with the blinds being 600/1,200. 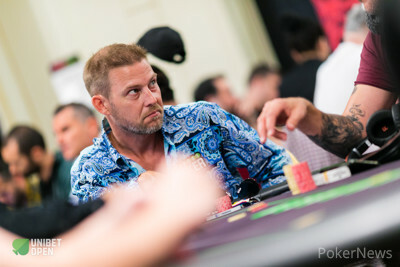 He managed to spin his stack up to 60,000 to make Day 2 but he is now playing a 160,000 stack and has plenty of blinds left with the field being 25 spots away from a €1,860 payday.